According to many analysts of China’s military, when an officer of the Chinese People’s Liberation Army (PLA) suggests new forms of operations, expanded domains of warfare, or new weapons systems, American security planners can dismiss these projections as merely “aspirational” thinking. 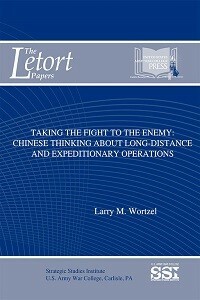 This assessment of the PLA Academy of Military Science publication Long Distance Operations and other military publications of this genre propose that suggestions for forms of future warfare capture currents of thinking among mid-grade officers and also reflect how the senior political and military leaders in China want the PLA to evolve. Among the trends identified in this Letort Paper is the requirement for a capacity to more effectively attack a distant adversary, such as the United States, and to hold that adversary’s population at risk. This analysis also shows that a number of military analysts in China perceive that the populace is at risk from attacks by stronger, distant states. In the past 5 years, the PLA has exercised to develop force projection and expeditionary capabilities. As described in brief in this analysis, in the past 6 months, the PLA has changed its own force structure and posture in ways that will facilitate expeditionary operations. This strategic assessment seeks to go beyond a traditional comparative analysis of the military, technological, political, cultural, and economic factors governing the relationships and capabilities of the Asia Pacific environment. To make sense of the intrinsic complexities unique to this region, we endeavor to broaden our view and rely on a tool often overlooked in government studies: imagination. 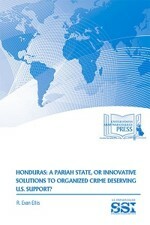 Moreover, we aim to offer a strategic document that is readable, instructive, and provocative. Pulling from a well-referenced piece of military teaching, this assessment borrows a learning concept first employed in 1904 by Major General Sir Ernest Dunlop Swinton in "The Defence of Duffer’s Drift." This fictional story describes the plight of young Lieutenant Backsight Forethought as he commands a 50-man platoon tasked to hold a tactically critical piece of land called Duffer’s Drift. The story unfolds in a series of six dreams, where the blunders of the unwitting lieutenant lead to disaster. As the dreams progress, he harnesses the lessons of each of his failures, and by applying these lessons, his platoon ultimately defends Duffer’s Drift. This monograph examines the impact that the “Arab Spring” has had on how Arab states relate to each other post-regime change and post-Islamist electoral victory. It shows that the region is undergoing a profound change as some traditional regional policy actors are paralyzed by internal turmoil (such as Syria and Egypt), while others do not have a regional ambition (such as Algeria and Morocco). The region has therefore entered a Gulf moment where key decisions pertaining to the region’s future are now taken in Riyadh, Doha, and Abu Dhabi. From having once been mere bystanders of regional politics, the Gulf States have moved to become players with both the ambition and capability to shape regional dynamics. As the ripple effects of their 2014 rift show, these dynamics will have a wider Arab impact.